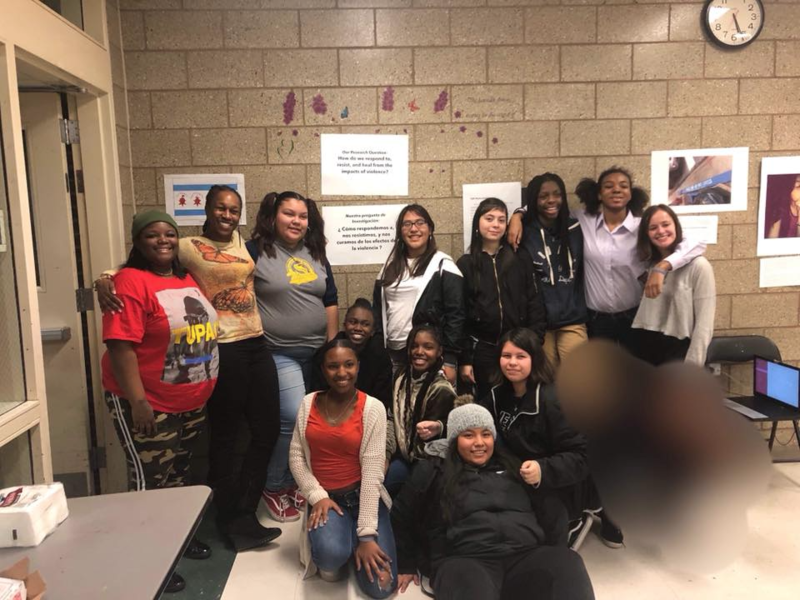 This fall, That Goddess Power (Family Matters’ Teen Girls Program) conducted a Photovoice project: a community-based participatory research project about the ways that we respond to, resist, and heal from the impacts of violence. The purpose of the project was to discuss different issues and solutions surrounding how violence has impacted our lives, what we see, and why we think these things happen. TGP worked on the Photovoice project every Monday for six weeks. Photovoice has three main goals: to enable people to record and reflect on their community’s strengths and concerns, to promote dialogue, and to reach policy makers. We took photos to represent how we felt about these different discussions. In our final workshop, we came up with six themes that capture our findings: Feelings, Every Picture Has A Message Behind It, Memories & Loved Ones To Be Remembered, Beauty is Everywhere / Overlooked World, Life Continues & We Move Forward, and Friend Support, Sister Bond, Love. Each photo connects to our themes in many different ways. At the end of the project, we organized a photo exhibit at Willye B. White to share our work with the community. We decorated unique frames for each one of our photos, and hung them alongside captions that explained the meaning behind the photo. We wanted everyone to see a different perspective of Rogers Park through our eyes. Our photo exhibit showed the unique talents each one of the photographers captured. We celebrated with food, music, and lots of friends and family from the community. Everyone who attended had the chance to respond our exhibit by hanging up a sticky note with their thoughts. The responses talked about how the exhibit was inspiring, how teen girls are resilient, and how our photos gave them hope and appreciation for youth in Rogers Park! Thank you to everyone who supported us and our Photovoice project. We are proud of our work and excited about the impact it had on us and our community.